Rumor has it that, back in the 1960s, Rolex wanted to create a luxury version of the Submariner. The diver after all, had been immensely successful and Rolex wanted to produce a second watch with a nautical theme. So they produced a prototype of a yachting chronograph. That early prototype, of which only two are known, was based on the Cosmograph Daytona, though it tips the caliper at 39.5mm instead of the Daytona’s then 36mm. in fact, the known examples are signed ‘Cosmograph.’ Eric Clapton is rumored to have owned one at one time, so at least one of the known examples escaped to the wild. Ultimately, Rolex did not release that watch. Instead, they waited a quarter century. And when the official Yacht-Master hit retailers shelves, it was no longer a chronograph. Rather, it looked like a customized Submariner. It first saw the light of day in 1992, as ref. 16628. This first watch was all 18K yellow gold. The bezel was bi-directional, and count up minute markers were etched into the permanent ‘insert.’ In fact, it wasn’t an insert at all in the classic Rolex Submariner / GMT sense. Rather, the bezel was all one piece of precious metal. One can easily believe it was intended as a sport watch for use on yachting weekends. 1994 saw the introduction of a 35mm (ref. 68628), ostensibly for the Asian market, but really intended for those with smaller wrists. Rolex also released a 29mm (ref. 69628) model, specifically aimed at women. 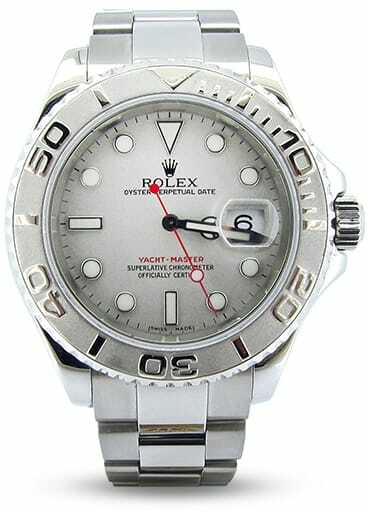 Rolex released a stainless steel/platinum model in 1999, with corresponding 29mm and 35mm versions. The Yacht-Master is only rated to 100m water resistance, despite the triplock crown. The aforementioned rumor that Rolex wanted to create a luxury version of the Submariner would explain the precious metal content of all references. And the precious metal in turn, may suggest why the watches are only rated to 100m of water resistance. After all, who wants to dive, etc. with a precious metal watch? So why bother with designing a watch to such a depth rating? Finally, in 2007, Rolex released an entirely new version, the Yacht-Master II. We’ll cover that in our next post. Ever wonder about the backstory of your favorite Rolex? Well, stick with us. 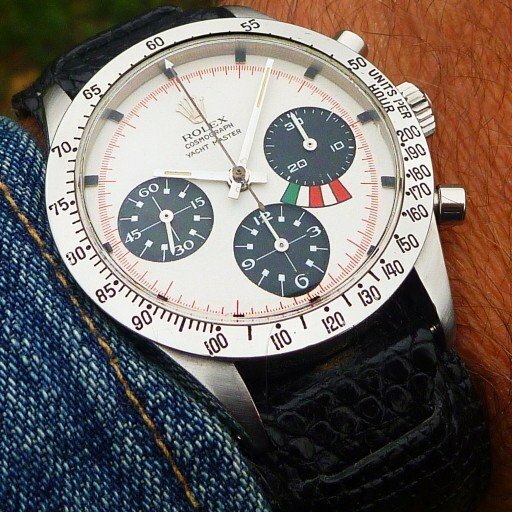 This is the thirteenth in a series of posts featuring histories of significant Rolex models. In all, Rolex has introduced nearly three dozen models since 1950. Ultimately, we’ll be touching on each of them. You’ll find all the reference numbers connected with each model here.